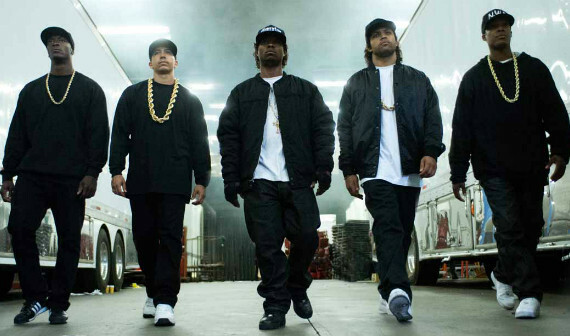 Starring: Corey Hawkins, Jason Mitchell, O’Shea Jackson Jr.
And here I thought I knew everything there was to know about Compton from watching Get Hard; consider my world rocked. But putting jokes aside, we so often get so much of our information from movies, or misinformation at times, allowing filmmakers to educate us through their own viewpoints. For comedic effect, with strong bias, after much omission; films can’t be made in a vacuum, the clarity of their stories are muddied by the humans who make them, and we should never completely believe what we see. With a docudrama like Straight Outta Compton, audiences will enjoy learning about a real life band, its humble beginnings, and its struggles to be heard. But we shouldn’t forget that this is a movie above all else, that’s it’s told from a certain side, and that it’s meant to entertain above all else. In that way, it succeeds much more than some of us thought that it would. This is the true story of N.W.A., the 80s & 90s rap group that changed the way Americans hear music. Living in Compton, California amid poverty, gang violence, and police brutality, a group of friends came together to deliver a message in an art form that was inspired by the streets. Dr. Dre, Eazy-E, Ice Cube, MC Ren, Dj Yella; N.W.A. would become the voice of a people, creating music about hard lives, big dreams, and reality above all. But as their stardom rose, so did the pressure, and the members of the group began to splinter. Eazy-E stuck with the band’s manager, Jerry Heller, who had made him rich. Ice Cube began an extremely successful solo career. And Dr. Dre would foster relationships with men who would define his career (Suge Knight, Snoop Dogg), helping him to become the mogul we know today. But the streets of Compton were where it all began. I mention this film being created from a certain viewpoint only because a one-sided feeling prevailed throughout the movie, and I thought it worth mentioning. I don’t know all the details of all the feuds between all the rappers, but this story was definitely told with one camp in mind. After all, the film was directed by the man who was the director of Friday, the film Ice Cube wrote & starred in. 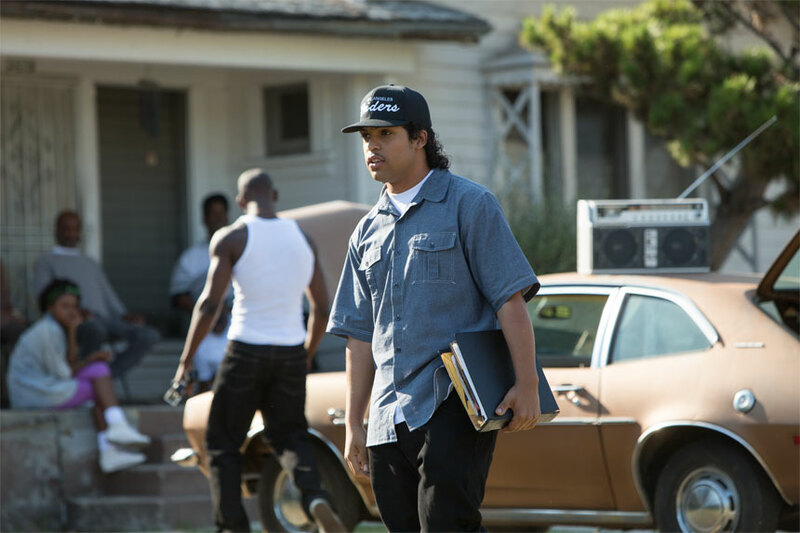 Also, Straight Outta Compton stars Ice Cube’s son, O’Shea Jackson Jr., who plays his own father. 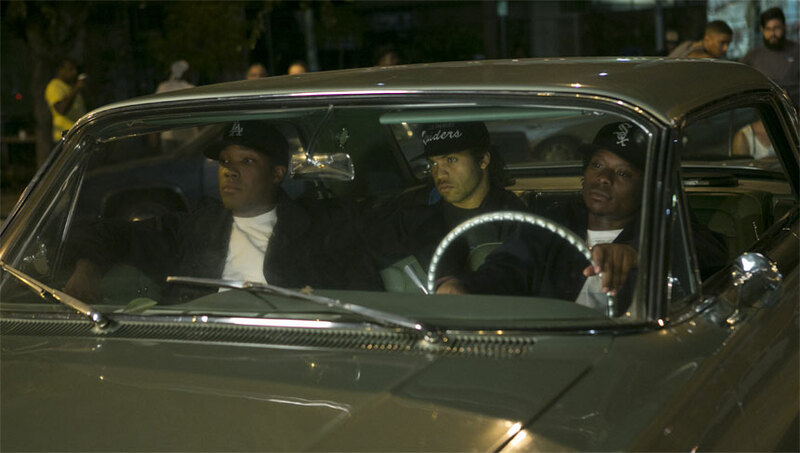 So it’s no surprise that Cube is seen as a hero in this film, that he is shown as the best writer in the group, and that the other side (Eazy-E, Jerry Heller) are the bad guys at times. I don’t care one way or the other, but I’m sure there are more sides to the story than we see, and that blatant fact is at least slightly off-putting while watching a true story. That also explains why Jackson is the worst actor in the film, failing to do much beyond look exactly like his real life father. In the scenes when he is forced to act alongside Hawkins or Mitchell, he falls flat and brings down the moment. Thankfully, Dre & E were played wonderfully, full of emotion & growth, making at least two characters that could support the film. And Paul Giamatti was perfect as the band’s greedy manager, nearly stealing the show. So, putting any bias the film was created with aside, the acting and the story were enough to get audiences on board. Not to mention the killer soundtrack, with songs straight from the classic albums, with lyrics & music brought to life right before out eyes, and with beats that forced your head to bounce. It was entertainment above all & in every way, combining awesome songs, a fascinating time, cool characters, and the standard band-breaks-up feel that we’ve come to love.